Located just 500 feet from S’Arenal Beach, Hotel Arcadia offers an outdoor pool and 24-hour reception. The simple rooms include tiled floors and a private bathroom. Most also have a balcony. 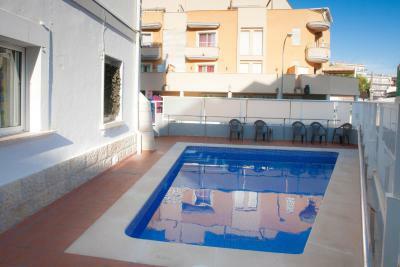 The Arcadia is located in southern Palma Bay, 3.1 mi from Palma Airport and 6.8 mi from Palma city center. Regular buses to the airport and city stop within 1,000 feet of the hotel. The hotel serves a daily buffet breakfast and has a snack bar with an outdoor terrace. You can also find a wide range of bars and restaurants in the center of El Arenal. Luggage storage and a safety deposit service are offered at reception. Car rental can be arranged on request. When would you like to stay at Hotel Arcadia? These simple rooms have tiled floors, a modern private bathroom, desk and telephone. House Rules Hotel Arcadia takes special requests – add in the next step! Hotel Arcadia accepts these cards and reserves the right to temporarily hold an amount prior to arrival. We need at least 5 reviews before we can calculate a review score. If you book and review your stay, you can help Hotel Arcadia meet this goal.